Craft brewing legend Don Barkley is back on Brew Ha Ha with Steve Jaxon, Mark Carpenter and Herlinda Heras today. Don tells the story of how his career began with Red Tail Ale, which he came up with in the early ‘80s. 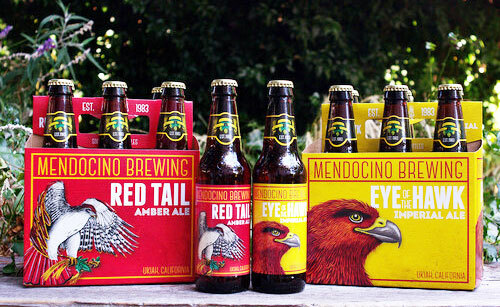 He founded Mendocino Brewing Co. in 1981 after he had worked at New Albion, the first craft brewery. They were operating in the Hopland Brewery. Now Don Barkley and Ron Lindenbusch are producing Red Tail Ale and Eye of the Hawk again, and they are both on tap at the newly reopened Hopland Tap House. For now, Red Tail Ale is on draft. They might produce it in cans later on. Right now they are making the beer at the Napa Smith Brewery. Don operated that brewery for about 10 years so he knows the equipment and the people, as well as the recipe. They use the same amount of hops during the boil but then they add a little more hops. They use Cascade, Cluster and Centennial. You can taste the male because the hops are light. The new Red Tail is 6/1% alcohol. They were inspired to name Eye of the Hawk by another beer that was called Eye of the Partridge. Don Barkley worked with Jack McCauliffe at New Albion Brewery in 1978. They made 100 cases of beer per week. Herlinda mentions that the Smithsonian interviewed Jack for their exhibit about brewing. Herlinda mentions that The Pink Boots Society has made a beer called Till There Are Nine beer dedicated to Ruth Bader Ginzburg. They taste the Eye of the Hawk beer which they notice has a little more alcohol than Red Tail Ale. Dan Barkley says that his beers all finish clean on the palette. Blue Heron was a Mendocino Brewing Co. IPA that for its time had strong hop flavors, although today it would seem mild. Dan remembers they used to have events for 4th of July, their anniversary and for Oktoberfest. As part of the festivities there was always a keg toss. They didn’t use a little 5 gallon keg, though. They used big 15.5 gallon kegs and it took some strength to throw them. Their champion was also the n.5 shot putter in the USA at the time and he put it 118″ out into the sand pit. Lastly they taste a barley wine called Talon. They keep it on the yeast for one year. This bottle is probably 12 years old.